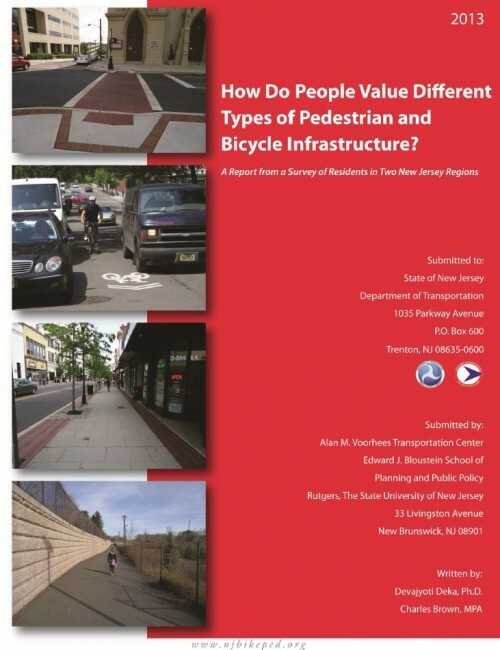 Due to the limited availability of information on people’s valuation of different types of bicycle and pedestrian infrastructure, the Alan M. Voorhees Transportation Center at Rutgers University undertook a survey of New Jersey residents by focusing on two large regions of the state, namely, the greater Bloomfield area of northern New Jersey and the greater Cherry Hill area of southern New Jersey. This report presents some of the key findings from the survey. It specifically focuses on people’s valuation of different types of bicycle and pedestrian infrastructure and the reasons for their valuation. The results from the analysis of other data collected through the survey will be presented in an expanded report.